Conceived in 1921 by Garden City mayor H. O. Trinkle, the pool was larger than a football field and had a surface area of 72,600 square feet. It could hold 2.6 million gallons of water. Initially, Garden City citizens were concerned over the cost of construction. To remedy this, the pool was turned into hometown project, with every resident encouraged to contribute labor, money, or building materials. 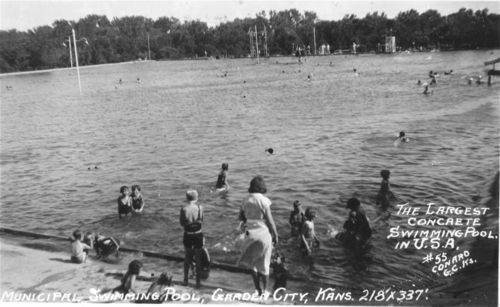 Thus the Big Pool was dug and lined with concrete by the people of Garden City. On it's dedication ceremony on July 18, 1922, hundreds of people dove into the water in unison to inaugurate Garden City's first summer swim season. The pool has been frequented by Garden City residents for generations and has become an historic landmark. In the 1930s at the height of the Great Depression the Works Progress Administration added a bath house. A children's wading pool was also added during this time. Due to the pool's immense size, it was possible for people to water ski across the surface of the pool. On two separate occasions in 1972 and 1987 people water skied across the water to promote Finnup Park, the zoo and the pool itself. In 1996 the Lee Richardson Zoo brought two female elephants to swim in the pool. Thousands lined the perimeter fence to watch the two elephants splash and play. By the late 1990s, age was starting to show on the pool and it was in need of a remodel. Wear and tear on the pool wasn't a new issue; in the pool's early years it was allowed to freeze over during the winter so it could be used for ice skating but this was discontinued when it was discovered that this was creating cracks in the concrete. The Garden City Commission laid an outline and it was found that a renovation would cost nearly $8 million dollars to complete. In 2003 management of the pool was taken over by the Garden City Recreation Commission and a user fee was instituted to go towards the renovation. While this solved the cost, it became the World's Largest Outdoor Concrete Municipal Swimming Pool.